must we be able to accommodate? These will be iterative trades as we begin to define the payload instruments and can intelligendy evaluate cost vs. performance. 3. Develop the Payload Operations Concept Ultimately, the data or product produced by the payload must get to the user in an appropriate form or format How will the end user of FireSat data receive and act on the satellite data? How will the manufacturer recover the WaferSat materials and define what is to be done on the next flight? Payload operations will have a major impact on the cost of both the spacecraft and mission operations. As discussed in Chap. IS, payload operations may be done by the same facility and personnel that handle the spacecraft or, similar to the Space Telescope, may be an entirely different operations activity. 4. 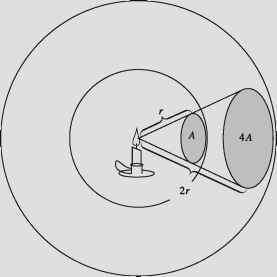 Determine the Required Payload Capability. What is the throughput and performance required of the payload equipment to meet the performance thresholds defined in Step 2? For FireSat what is the specification on the equipment needed to meet the temperature, resolution, or geolocation requirements? For WaferSat, how many wafers of what size will it produce? For mobile communications, now many phone calls or television channels must it handle simultaneously? 5. Identify Candidate Payloads. Here we identify the possible payloads and their specifications. For simple missions there will be a single payload instrument For most missions, there will be multiple instruments or units which frequently must work together to meet mission requirements. Different complements of equipment may break the tasks down in different ways and may even work with different aspects of the subject Thus, a system designed to identify the source of solar storms may have an imager and a spectrometer or a magnetometer and an instrument to map small temperature fluctuations on the photosphere or in the solar wind. 6. Estimate Candidate Payload Characteristics. Here we need to determine the performance characteristics, the cost and the impact on the spacecraft bus and ground system so that we can understand the cost vs. performance for each of the viable candidate systems. Payloads will differ in their performance and cost but also in weight power, pointing, data rate, thermal, structural support, orbit commanding, and processing requirements. We must know all of these impacts to conduct meaningful trades. 7. Evaluate Candidates and Select a Baseline. Here we examine the alternatives and make a preliminary selection of the payload combination that will best meet our cost and performance objectives. In selecting a baseline, we must decide which elements of performance are worth how much money. The payload baseline is strongly related to the mission baseline and can not be defined in isolation of the rest of the parts of the mission and what it will be able do for the end user. 9. Define Payload-derived Requirements. In this step we provide a detailed definition of the impact of the selected payloads on the requirements for the rest of the system (i.e., the spacecraft bus, the ground segment and mission operations). FireSat will have power, pointing, geolocation, and data rate requirements. WaferSat may care very little about pointing and geolocation, but will have requirements on the spacecraft cleanliness levels and jitter control. These, in turn, may levy secondary requirements such as storage for onboard commands or thermal stability for pointing and jitter control. 10. Document and Iterate. Although this point is emphasized throughout the book, we stress again the need to document what we have decided and why. The "why" is critical to allowing the system trades to proceed at a future time. We can make preliminary decisions for a wide variety of reasons, but we must understand these reasons in order to intelligently continue to do payload and system trades. Like all of the space mission analysis and design process, payload definition is iterative. We will come back to the process many times as we learn more about the consequences of preliminary choices. Figure 9-2 illustrates the conceptual process of payload sizing. At the bottom end of the curve, we need to spend a minimum amount of money to achieve any performance at all. Near minimum performance, a small amount of additional expense will substantially increase performance. 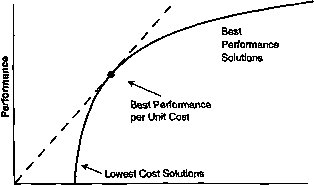 At the top end of the curve, we can spend a lot of money for very small improvement The overall payload performance per unit cost follows a straight line through the origin and whatever point on the performance vs. cost curve we are working at Therefore, the maximum performance per unit cost occurs where a straight line through the origin is tangent to the curve. Fig. 9-2. Performance vs. Cost The tangent point is the highest performance per unit cost. The key to deciding how to size our payload is to look carefully at the mission objectives, particularly the tacit rules which often imply how well we want to do. Do we need the best performance regardless of cost? Can the mission proceed only on a minimum budget? Is this a long-term, continuing, and potentially competitive activity in which performance per unit cost is critical? The answers to these questions will let us correctly size the payload and the mission to meet our mission objectives. Defining requirements and constraints for. space missions occurs as described in Chaps. 1 and 2. The overall mission requirements dictate the technical performance of the payload, while the mission concepts and constraints determine the operational implementation for the mission. Frequently the technical specification and operations concept for payloads are interrelated. For example, increasing temporal resolution (revisit) may reduce the requirement for spatial resolution in an optical sensor system. We must ensure that the mission requirements capture the fundamental needs of the users without constraining the designer's ability to satisfy these requirements through alternate technical means. • Can a new fire be detected within 2 hours? Twenty minutes? • What is the geographic extent of the fire? • Can smoldering fires be distinguished from flaming fires? • What are the primary combustibles (can fires burning organic material be distinguished from petroleum and chemical fires)? • What direction is the fire spreading and how quickly? • How much smoke and ash is the fire generating? • Where is the fire burning hottest? • At which locations would additional firefighting efforts to contain and suppress the fire be most effective? • What other sources of information exist from air-, ground-, or space-based sources? • If available, how might other sources of information be used? Establishing performance thresholds provides a framework for trading off performance across a number of different design features. For all missions, payload performance evaluation categories include physical performance constraints and operational constraints. Examples of physical performance constraints include limits on spatial, spectra], radiometric, and temporal resolution. Operational constraints include sensor duty cycle limits, tasking and scheduling limits on sensor time, and resource contention (inability of the sensor to view two targets of interest simultaneously). Within each of the categories of sensor constraints, we should establish an absolute minimum threshold such that any performance that does not meet this capability is unacceptable. The minimum threshold values generally will not satisfy mission objectives, but establishing the minimum level of usefulness for the mission allows flexibility for trade-offs. At the other extreme, we should specify the desired performance to establish the performance that will fully satisfy the requirement We can also define an intermediate value—an acceptable level of performance—to articulate a desired level of performance that will meet the bulk of mission objectives. Table 9-3 illustrates a sample of performance thresholds for the FireSat mission payload across the functional areas of resolution, quantity, timeliness, periodicity, geolocation accuracy, and completeness. These distinctions can be critical in determining the viability of a mission concept In commercial remote sensing, for example, the range of performance requirements from minimum to desired is typically determined through extensive market analysis and business development case studies. These studies frequently identify a minimnm resolution (or other performance parameter) below which a remote sensing spacecraft concept will not be profitable. TABLE 9-3. Sample Threshold Performance Requirements for the FireSat Payload. Desired performance represents the maximum reasonable level of performance across all design features.